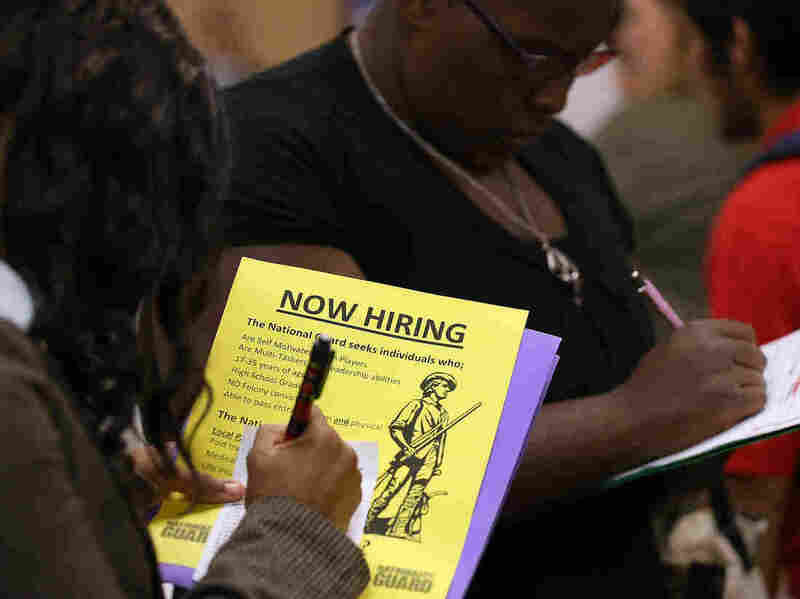 Fewer Jobs Than Expected In Sept., But Jobless Rate Fell : The Two-Way Though only 148,000 more people were on employers' payrolls, the unemployment rate still dipped to 7.2 percent from 7.3 percent a month earlier. The report, which was delayed more than two weeks because of the partial government shutdown, is the latest look at how the economy is faring. People looking for work were filling out applications earlier this month at a career fair in Emeryville, Calif. The nation's jobless rate ticked down to 7.2 percent in September from 7.3 percent in August, the Bureau of Labor Statistics said Tuesday. But just 148,000 were added to public and private payrolls. That's below the 180,000 economists expected. It's yet another sign that job growth remains soft. We added much more from the report, as well as reactions to it, as the morning continued. "While job growth remained solid in September, there is no question that the focus of policy should be on how to achieve a faster pace of job growth by increasing certainty and investing in jobs, rather than the self-inflicted wounds of the past several weeks that increased uncertainty and inhibited job growth," writes Jason Furman, chairman of the president's Council of Economic Advisers. He adds that "today's delayed report describes the economy more than a month ago. More recent indicators suggest the labor market worsened in the month of October." Furman's reference to "self-inflicted wounds" is about what the White House views as the misguided move by some conservative Republicans to force a partial shutdown of the government. Earlier, House Speaker John Boehner, R-Ohio, issued his own statement that blames Obama administration's policies for the economy's troubles. Figuring out why the stock market does what it does is never easy. But since stocks were up modestly after the opening bell in New York, it would seem that the employment report did not shock Wall Street. The Wall Street Journal says the early thinking appears to be that relatively weak news on the jobs front means the Federal Reserve won't be moving to scale back on the stimulus it's been giving the economy until next year. And at least some investors seem to like the idea of more money coming into the economy via the Fed's bond-buying program. "Today's report shows the president has more than a troubled website to fix — he has a troubled economy, weakened by years of failed 'stimulus' policies and excessive red tape," House Speaker John Boehner, R-Ohio, says in a statement emailed to reporters. "Add the higher costs and rising premiums of ObamaCare on top of disappointing jobs numbers and underwhelming wage growth, and you have a recipe for economic stagnation." The White House typically posts its analysis of the jobs report on its blog. We'll add a highlight when it's available. Update at 9:10 a.m. ET. If Job Growth Was Slow, Why Did The Unemployment Rate Edge Down? Economists remind us every month that the BLS news is really two reports combined into one. The jobs figures come from surveys of public and private employers. The unemployment rate, meanwhile, comes from a survey of households. The data from households show that the number of adults who said they were working grew by 133,000. At the same time, the number who reported being unemployed fell by 61,000. Meanwhile, the percentage of people who were said to be participating in the labor force (either because they were working or looking for work) held steady at 63.2 percent. All those numbers basically point to the same conclusion: the households survey signals that there was little change in the situation — but that there was just enough to nudge down the jobless rate. "The September payroll figure reflects the pay period that includes the 12th of the month, two weeks prior to the federal shutdown," Bloomberg News notes. It adds that "today's report doesn't include any late responses from employers, indicating the figures will be subject to revision as is typical each month." Since the shutdown hurt businesses that deal with the government or depend on it being opened, it's unlikely the revisions would be to the upside. As The Wall Street Journal writes, the Federal Reserve "surprised some investors by not starting a pullback in its $85 billion-a-month bond buying program after its September meeting. The central bank is not expected to make any changes until it can assess the full effects of the 16-day government shutdown and debt-ceiling fight on the broader economy. But a weakening jobs picture could force it to push out this date out further." The Fed has been buying bonds to push money in to the economy and spur growth. At 7.2 percent, the unemployment rate is now the lowest since November 2008's 6.8 percent. The jobless rate is still about 3 percentage points above its recent low — the 4.4 percent of late 2006 and early 2007. The economy officially slipped into recession in December 2007 and didn't begin its slow recovery until June 2009. The unemployment rate's recent peak was 10 percent, in October 2009. For the second report in a row, BLS sharply reduced its estimate of job growth in July. It initially thought employers had added 162,000 jobs to their payrolls that month. In a subsequent report, it pegged growth at 104,000 jobs. Tuesday, it said employers had added just 89,000 jobs in July. But at the same time, BLS on Tuesday revised up its estimate of the job growth in August. Initially, it said there had been 169,000 jobs added. Now, it estimates there were 193,000 more people on payrolls.